Grover Cleveland College is dying, and the shock is too much for the college's founder and president, Cyrus Cleveland--a direct descendant of President Grover Cleveland--who begins to die in tandem with his school. In a last bid to save his beloved institution, he wills the college to his nephew Marcus Cleveland, a used car salesman in New Jersey who has never been to college, much less administered one. Marcus heads north to see what he can do to live up to his uncle's expectations and save the day. Facing the impending calamity with cheer, an incorrigibly sunny attitude, and ample naivete, he is totally unprepared for the stew of discontented faculty, internecine rivalries, and unforeseen events that threaten to upend his every effort to rescue the school from the threat of extinction. Robert Klose teaches at the University of Maine at Augusta. He is a regular contributor of essays to the Christian Science Monitor. His work has also appeared in Newsweek, the Boston Globe, Reader's Digest, Exquisite Corpse, Confrontation, and elsewhere. His books include Adopting Alyosha--A Single Man Finds a Son in Russia; Small Worlds--Adopted Sons, Pet Piranhas, and Other Mortal Concerns; and The Three-Legged Woman and Other Excursions in Teaching. 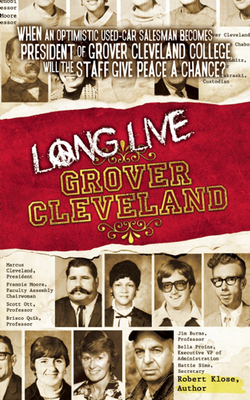 Long Live Grover Cleveland is his first novel.